Manx Arts Centre Kensington Road Douglas production of Fame dress rehearsal. 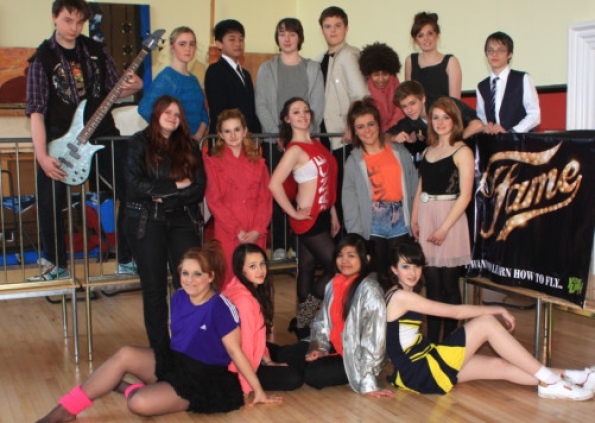 THE eagerly awaited production of Fame the Musical by the Youth Arts Centre is coming to the Gaiety Theatre this month. Based on the hit ’80s film and subsequent television series, Fame the Musical continues the story of New York city’s Performing Arts School and its talented, star-struck students. Representing all the schools on the island, the 30-strong cast, aged 13 to 16, has been rehearsing at the centre in Kensington Road, Douglas, with director Thomas Iain Dixon, choreographer Kat Ash and vocal coach Joey Wylde, who have been working under the mentorship of Nicholas Roberts. The all-singing, all-dancing cast will take to the stage on Friday and Saturday, May 18 and 19, at 7.30pm. The story revolves around 10 students and their hopes and dreams. Carmen Diaz (Fran Glover) is an insecure but talented Latino girl with big dreams of Hollywood. She, together with aspiring actor Nick Piazza (Michael Cowin) are thought to be the ones most likely to succeed, or so they think. The Fame school has its musicians Grace Lamb (Jenni Ketteridge, who has learned to play the drums for this show), Goodman King (Conor Strickland, who learnt the bass guitar) and Schlomo Metzenbaum, played by Hezakiah Tarcaden (already a skilled keyboard player). The musicians’ role is to move the story forward as we meet rap artist and dancer Tyrone (Kenzie Allison) and ballet dancer Iris (Grace Hoodless), comedians Mabel (Hannah Tacarden) and Joe Vegas (James Mitchell), and aspiring actress Serena (Kellie de Vos) who suffers unrequited love. Their stories weave in and out of the music and it is impossible not to hope and play for their success. The students work hard under the tuition of Principle Miss Sherman (Alex Domingo), who has given her life over to the school, and teachers Mr Myers (Andrew Deignton), Mr Sheinkopf (Mark Cain) and Miss Bell (Louisa Bowker). It is their job not only to teach the students to sing and dance but also to make sure they get through their education, too, and when it looks like Tyrone will fail maths and have to leave the school because of it, their job gets very hard. She said: ‘Like all our other productions, including Camp Rock and Rent, all the roles on and offstage are taken by people under the age of 25. ‘For many it is the first time they have had the responsibility of a production, including Tom and Kat, who are both performing arts graduates. She added: ‘This production has been a great adventure. ‘Working with young people and seeing them thrive under the challenge of putting on a full-scale West End musical is a brilliant experience. ‘We are grateful for the help, guidance and advice of our musical mentor, Nicholas Roberts, who has worked tirelessly with the cast and crew, giving them the benefit of his talent and experience, as well as encouragement and kind words when needed.